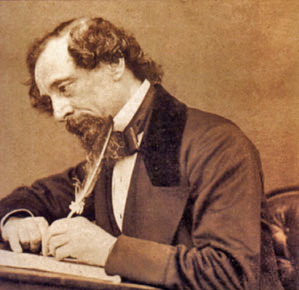 Charles Dickens, Spy Novelist – The Bookshelf of Emily J. Reading Dickens pleases my husband. He has no idea that the first lines of A Tale of Two Cities are, “It was the best of times, it was the worst of times,” yet I could detect his pleasure at seeing me sprawled out on the couch with that heavy volume balanced on my stomach (281). He bought that volume of four novels for me. It’s one of those leather-bound books with gold edges from Barnes and Noble. Each Christmas, my husband gives me one or two of these coveted books. This year, he bought five of them after paying close attention to a conversation I had with a neighbor about all of the leather books on our shelves. This neighbor quizzed me on my top five favorite books – Angle of Repose by Wallace Stegner, The Picture of Dorian Gray by Oscar Wilde, Dracula by Bram Stoker, anything by William Shakespeare, and Willa Cather’s My Antonia. However, A Tree Grows in Brooklyn by Betty Smith or Mama Day by Gloria Naylor could easily be on that list depending on my mood. My husband, whom I thought was completely uninterested in such literary conversation (he’s a CPA), apparently made mental notes. I received fancy versions of The Picture of Dorian Gray and Dracula a few weeks later as presents to my extreme delight. I find the books to be treasures, but more joy comes from knowing that my husband cares enough to listen so closely and surprise me. Anyway, back to Mr. Dickens, pictured below. I recently read A Tale of Two Cities (number 57 on the BBC book list) for the first time. I felt smart reading those famous first lines, as if I were about to accomplish something great. However, that feeling soon turned to yawns and difficulty keeping my eyes open. I am not saying that Dickens is boring. Far from it. But, one must be an attentive and active reader in order to gain the most from a Dickens novel. And gain I did. His treatment of the relationship between Lucie and her father is tender and emotionally honest. When she first meets him after being separated for years, she falls upon her knees and gives the most beautiful speech to remind him of his former life and her devotion to him. She is selfless and loving, everything a good daughter should be. However, the true beauty of this novel comes at the end, as with most great novels. The events leading up to the denouement pale in comparison to the awe inspiring actions of Sydney Carton. As Carton entered Charles Darnay’s prison cell, I had no idea what was about to occur. However, as soon as he insists on changing clothes with him, I knew. And the tears would not stop. It is the ultimate sacrifice to give up one’s own life for another. There is no act like it. However, I worried that this plan would not be carried off smoothly, for how would Carton convince Darnay to leave him there to die? At this point, I should have remembered all of the episodes I’ve watched of 24 with daring Jack Bauer or of Burn Notice with Michael Westen’s spy tricks. But I did not think of these things, for who knew Dickens to be a spy novelist? Yet, he is. After convincing Darnay to switch clothes with him, Carton uses a chloroform-like vapor to render Darnay unconscious against his will. Carton then completes the rest of the switcheroo. How action packed and exciting is that? No need for yawning and forced active reading. Dickens now had my full attention. My heart raced, my hands gripped the book, and I began to read with speed that probably left some of my comprehension to be desired. I worried for daring and heroic Sydney Carton. Would he actually meet the guillotine? I worried for Darnay and Lucie. Would they meet again? And then, while Darnay is being removed from the prison unconscious, the scene changes to Miss Pross, who whips out her ninja skills and defeats Madame Defarge in a catfight any boy at my high school would have paid to see! (Once I witnessed a fight in which one girl ripped the other’s shirt and bra off, but she kept on swinging with one arm while she covered herself with the other!) Miss Pross engages Madame Defarge to protect Lucie, who is fleeing France. The best line: “‘You might, from your appearance, be the wife of Lucifer,’ said Miss Pross, in her breathing. ‘Nevertheless, you shall not get the better of me. I am an Englishwoman’” (501). Well, you can’t argue with that! Miss Pross continues talking to keep Madame Defarge guessing over Lucie’s whereabouts as long as she can. When that gets old, the two women engage in a hand-to-hand battle. Miss Pross handily defeats the knitting monster by shooting Madame Defarge with her own gun. Overall, my first moments of excitement at reading a classic novel, which everyone should read, returned with the climax of the action. Dickens is a literary genius who should also have written scripts for Hollywood. Because Hollywood is so adept at using cliffhangers (a literary device actually invented by Thomas Hardy), I will leave you with one. If you’d like to know what happened to Mr. and Mrs. Darnay, you’ll have to read the book. Are the lovers reunited? Tune in next time on A Tale of Two Cities. terrific book, no doubt. hugo’s treatment of cosette meeting valjean is similarly tender. while i understand the issue of the HEAVY book, you can lessen the impact of such a tome by buying a KINDLE. now, i LOVE books, too, but i will never buy another one if i can read it on the kindle. i loved 8 trac tape players, too, and reel-to-reel tape players, but they be gone, baby!!! book are Dinosaurs; you may love them (and i do) but they are going to be as extinct as the Tyrannosaurus pretty soon. Don’t kill the messenger; i just speak the truth! love ya’ girl!! You’re so funny, Alex. I miss you! I love this! Reminds me of when I slogged through Les Miserables in high school. Eight months of reading and only a few skipped pages (about military tactics and yawn inducing batte details) later, I had read what remains on my top 5 list of best written and most interesting books I had ever read. I was so proud. I still am. Everyone should read at least one truly classic novel in their lifetime. I love what you have done here, making the classic novel an exciting thriller through your excitement for and understanding of the material. Some people hear “classic” and assume they’re in for a hard-to-read bore. But those dusty old books are classics for a reason, aren’t they? That said, I hated Frankenstein. I need to read Dracula this year. I started Frankenstein once and didn’t get far, but it is on my shelf and I plan to read it someday. You’ll like Dracula. It isn’t boring at all! Pingback: The Hitchhiker’s Guide to the Galaxy: A Smelly Book Full of Clichés « The Bookshelf of Emily J.
I came late to Dickens and had probably seen most of his books as films before I started to read them, however even knowing what was coming at the end of A Tale of Two Cities didn’t blunt it. I’m glad I found Dickens late because it means I still have a lot to look forward to. That’s so true! Dickens makes it exciting even if you already know the ending. I have a lot to look forward to as well. I’ve only read two of his novels. Pingback: Book Quiz Answers and a Winner! « The Bookshelf of Emily J.
Pingback: How Many Oprah Books Have You Read? | The Bookshelf of Emily J.
Pingback: My Top Ten Classic Novels for Teenage Girls | The Bookshelf of Emily J.
Pingback: Throwback Thursday: Charles Dickens, Spy Novelist | The Bookshelf of Emily J.